During our second visit to Oaxaca, we shopped daily at the "El Merced" mercado. After a while, the vendors at our favorite stands started to recognize us. 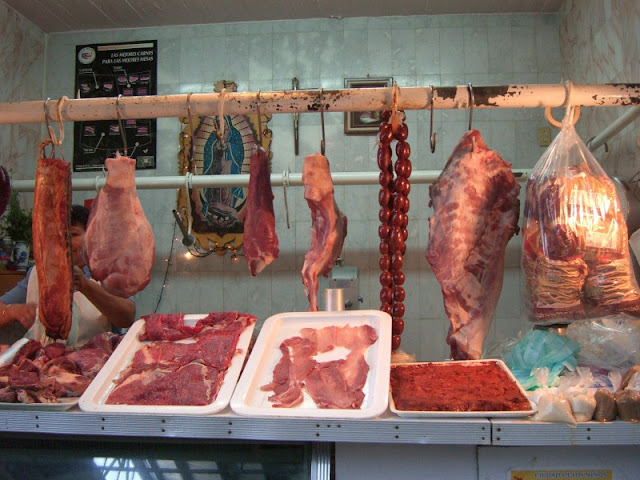 Above is a picture of the carnicería we did our shopping at. 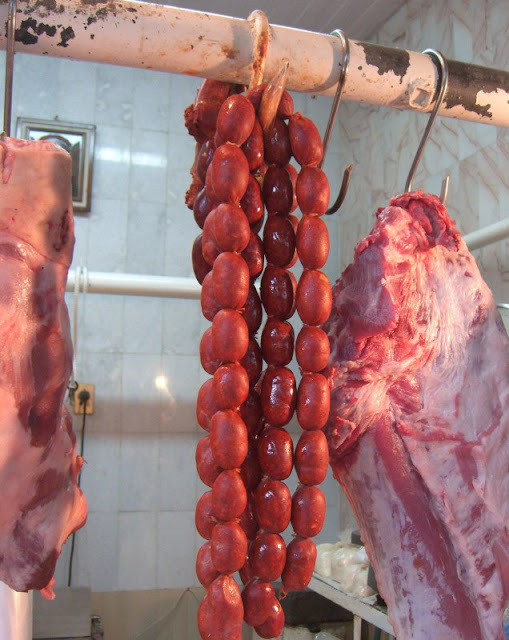 The little sausage links you see hanging are very typically Oaxacan. The lighter ones are beef, and the darker ones are pork. They taste similar, both having a sharp, tangy and spicy flavor. 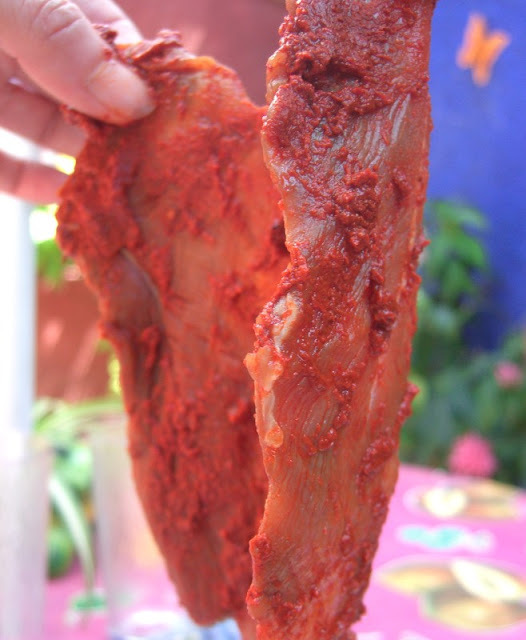 As we mentioned in our Mexican breakfast post, we used chorizo a lot during our stay. The trays in the center of the stall are also very Oaxacan. 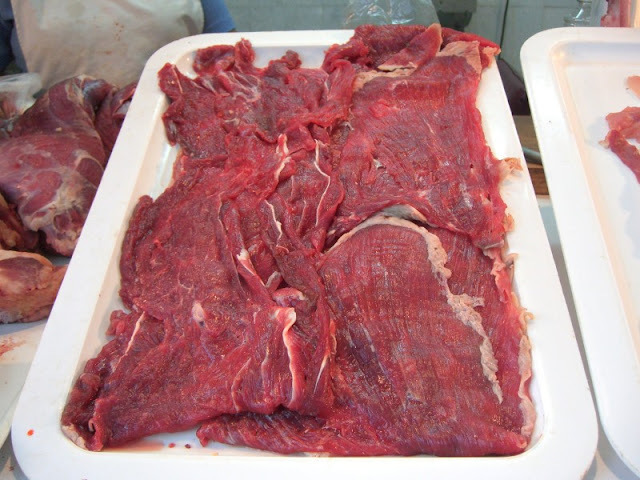 First up is tasajo, which is thinly pounded beef that has been air-dried (the amount of aging varies - you see everything from very fresh, red meat to that which has darkened considerably with age). Tasajo has a very rich, full flavor, perhaps from some sort of marinade (although as you can see below there are no obvious visual signs of it). 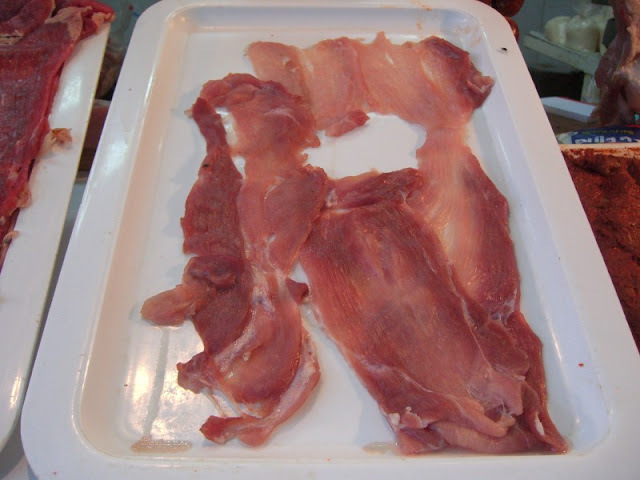 Next up is cecina, which is also pounded thin, but is made from pork rather than beef. 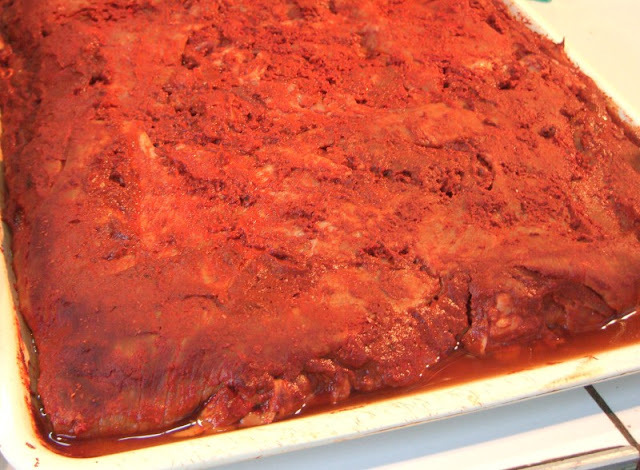 And the chile-rubbed version of cecina is called enchilada. Here you can see the enchilado out of the tray. One day we bought both tasajo and enchilado from the market and made up a taco platter. 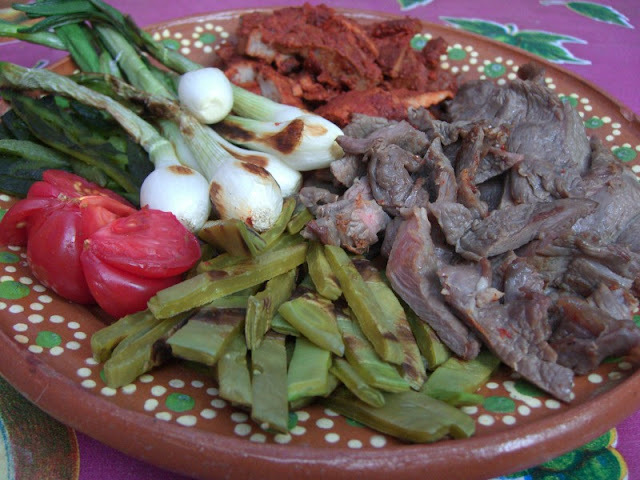 The green sliced in the front are nopalitos - made from prickly pear cactus leaves that have been trimmed (not by us - you can buy them prepared at the market, usually from little old ladies sitting outside or in the aisles) and grilled. 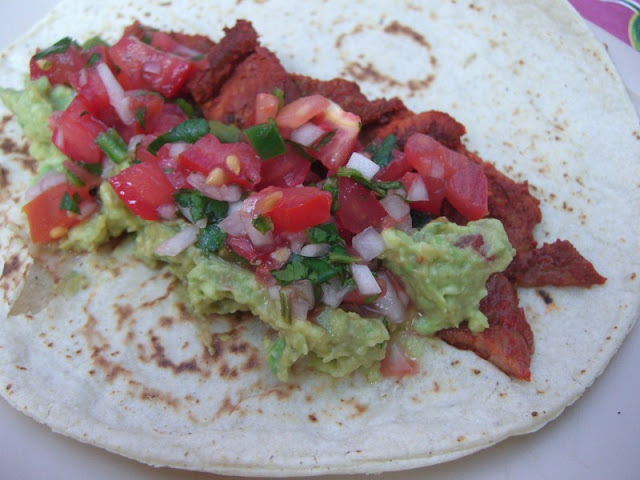 Put some meat in a warm corn tortilla, plop on some guacamole and pico de gallo and you're ready to go. In addition to the meats shown above, we also bought pork trimmings one day which the vendor told us would be perfect for making posole broth. She was right. did a search on Cesina y Tasajo and your site came up. Pretty cool man, i'm doing a write up on an interesting place i L.A that serves this stuff. should check out the post, think you would like it.